Harmonic Drive is the brand name of wave of wave of arts registered by the company Harmonic Drive, invented in 1957 by C.W. Musser. It is very commonly implemented in today’s robotics and also used in the aerospace industry for gear reduction, but it can also be used to increase the speed of rotation or for differential gears. The harmonics drive, which is composed of a circular spline, a wave generator and a flexspline, is a compact, light and precise torque transmission mechanism with little backlash. From these components, the flexspline is the key element for the transmission of movement. It must be flexible in the radial direction but rigid in the tangential direction to accurately convey the rotational movement. In order to satisfy this double role, the conventional flexible steel line is usually fabricated as a thin cup shape requiring a large amount of machining using special templates. Due to the thin shape of the cup, the flexible steel line produces noise and vibration when operating at high speed. Since the double paper can not be effectively met with conventional isotropic materials, anisotropic composites have been considered. In this paper the flex section section of the flexspline was fabricated with carbon fiber epoxy composite and the tooth section with steel. The two components were then joined by adhesive bonding. In addition, to facilitate the manufacture of the flexible steel plate and to reduce the noise and vibration of the harmonic drive, the cup and tooth sections were manufactured separately and adhesively bonded. The static torque transmission capacities and the vibration characteristics of the flexible flexing line with adhered steel teeth and the flexible steel line with adhered steel teeth were tested experimentally. From these tests, the flexible line fabricated with adhesive bonding was found to have sufficient torque transmission capacities and both the composite flexible line and the bound steel line had better dynamic characteristics than the flexible steel line of a Conventional single piece. New technologies which are mainly based on high speed and precision (robots, manipulators, machine tools, etc.) impose special requirements for gears. Other technologies such as telescopes, radar systems, antenna systems, etc., require high accuracy and speed of positioning. Common for all these facilities and devices are transfer of information, energy and materials from one state to another without bringing their own faults in the system. So, it is important that gears do not have excessive internal backlash. 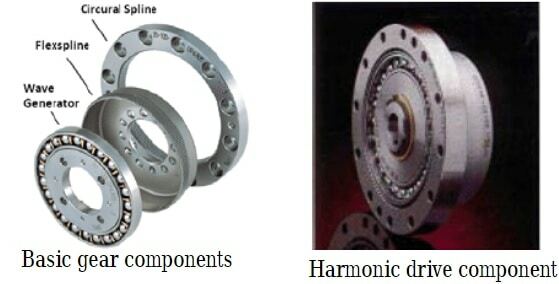 Harmonic drive gears are one of the newer gears which in there is no internal backlash. Harmonic drive gears have other advantages such as high capacity output bearing, high torque capacity, excellent positioning accuracy and repeatability, compact design, high single stage ratios, high torsional stiffness, high efficiency, simple installation and assembly, etc. In this paper it is described some cases of using Harmonic drive gear in machine tools. The basic components of the flat-type gear system are the Wave Generator and three gearwheels – the Flexspline, Circular Spline and Dynamic Spline. The Wave Generator consists of a sun gear, typically connected to the motor shaft, and two elastically deformable planet gears. The teeth of the planet gears engage with the internal teeth of the Flexspline, which also features external teeth that engage with the Circular and Dynamic Spline. The Flexspline is a thin-walled elastically deformable ring, that adopts the elliptical shape of the Wave Generator. The external teeth of the Flexspline engage with the internal teeth of both the Circular Spline and the Dynamic Spline. The Circular Spline is an internally toothed ring gear and engages with the Flexspline at both ends of the major elliptical axis of the Wave Generator. The Circular Spline possesses two teeth more than the Flexspline. The Dynamic Spline is an internally toothed ring gear with the same number of teeth as the Flexspline. This component rotates in the same direction and with the same speed as the Flexspline and is used as output element when the gear is used as a speed reducer. The Micro Harmonic Drive gear is based on a unique principle of operation. When used as a speed reducer, the Wave Generator acts as the input element. By means of the planet gears the Wave Generator deforms the Flexspline elliptically, such that it engages with both internally toothed ring gears, the Circular Spline and the Dynamic Spline. The rotation of the planet gears of the Wave Generator causes the major elliptical axis and thereby the regions of tooth contact to rotate relative to the fixed Circular Spline. Because the Flexspline possesses two teeth less than the Circular Spline, for each 180° clockwise movement of the Wave Generator, the Flexspline moves counterclockwise by one tooth relative to the Circular Spline. Each complete clockwise rotation of the Wave Generator results in the Flexspline moving counterclockwise by two teeth from its previous position relative to the Circular Spline. The Dynamic Spline rotates in the same direction and with the same speed as the Flexspline and is used as the output element. The advantages include: no backlash, high compactness and light weight, high gear ratios, reconfigurable ratios within a standard housing, good resolution and excellent repeatability (linear representation) when repositioning inertial loads,high torque capability, and coaxial input and output shafts.High gear reduction ratios are possible in a small volume (a ratio from 30:1 up to 320:1 is possible in the same space in which planetary gears typically only produce a 10:1 ratio).